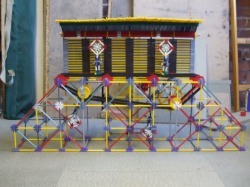 This knex duck shoot took 2 weeks to design and build and is of a high standard, the best knex target I have seen on the internet. It has sensitively set falling targets so they fall easily when hit but they do allow small movements which means they dont fall when you dont want them to. You will need a knex motor which you can get in case sets off knex.com or ebay . You can also add more targets if you can shoot them quickly enough. From 4mins 23 seconds onwards is the roof which uses alot of knex pieces and is not vital for the finished model so you can leave that out.